Styles of Beyond is an alternative hip hop band from Los Angeles, California. Its roster consists of MCs Ryan Maginn (Ryu) and Takbir Bashir (Tak), Raisin Fisher (DJ Cheapshot), and producer Vin Skully. 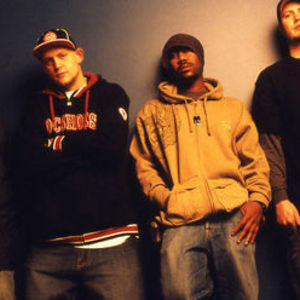 They have released two LPs and were heavily featured on Mike Shinoda's Fort Minor release, The Rising Tied. They were signed to Shinoda's Machine Shop Recordings label, but were released from it due to issues with Warner. They are also associated with the Demigodz supergroup which features similar artists such as Apathy, Celph Titled, and 7L & Esoteric. Styles of Beyond collaborated with Celldweller for a track entitled "Shapeshifter" which was featured on the game Need For Speed: Most Wanted and will also appear on the upcoming Celldweller album. The third studio album was originally supposed to be released 2006 but was delayed to 2007, and then again delayed to 2008. However, in March 2008 the band announced the album titled "Reseda Beach" (formerly known as Rocket Surgery) has been finished and is waiting to be released by the label.